Question first then background: Is this the correct gap between a Viggen pressure plate (PN: 3082302731 ) and flat flywheel before you bolt in down with spacers. I dont have spare bolts on hand but this looks excessive. 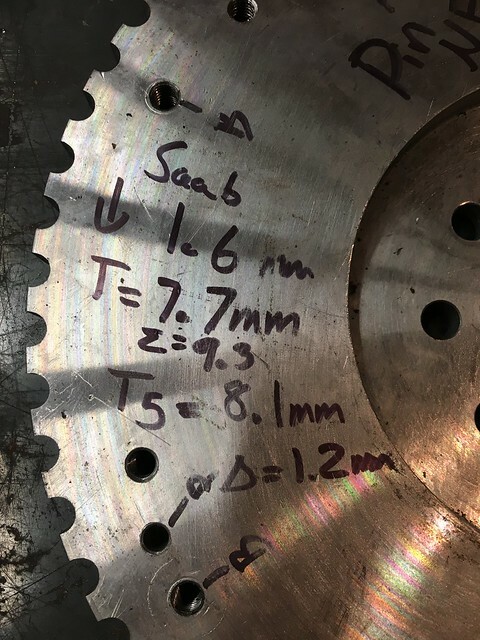 Im doing a T5 swap and have followed what ive read on various other posts about using a STS machining flat flywheel (Ive got lh 2.4) along with a Viggen pressure plate and ford 9 inch disc. I have the correct dowl pin location and the pressure plate lines up, but with the disc in place sits quite far away from flywheel. The dowl pins don't even touch the pressure plate. I have new bolts on the way and will try adding spacers but want to know if this is normal for those who have used this combination. You’ll want to use some washers that are ~.040in thick. I used some "1/4in" washers that had a 5/16" inner hole diameter, and it worked great. Saab viggen FW is dished 1.6mm, and uses a 7.7mm thick disk. 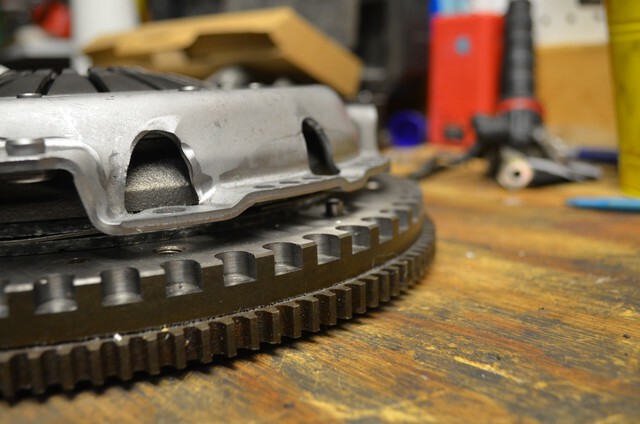 This results in a pressure plate friction surface to flywheel surface spacing of 9.3mm. The Ford disk I used was 8.1mm thick (clamped), so 9.3-8.1= 1.2mm of spacer that is needed. Last edited by culberro; 04-16-2019 at 01:21 PM.. Reason: Corrected previous post shim thickness.